We began our hike on the Big Arsenic Springs trail about 2:30 on the afternoon of a clear, sunny autumn day. 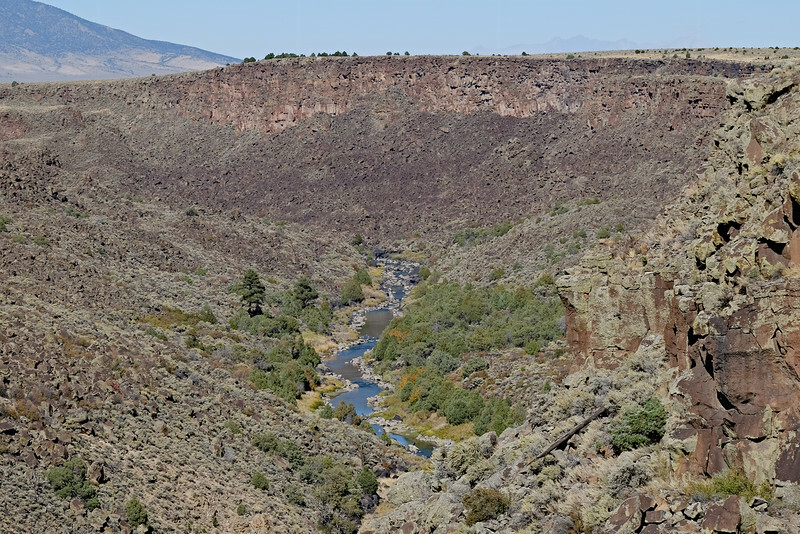 The trail descends 680 feet to the river and a cold water spring from the canyon rim in the Rio Grande Gorge. Although only one mile long, the hike is fairly strenuous, given the steep, rocky descent and climb back out, but the views and experience of the river and spring are well worth the effort. It is quite different from standing on the rim, or the Gorge Bridge, looking out and down. The canyon is quite lush, with lots of piñon and Ponderosa pine, juniper, Douglas fir, and many and various shrubs. The river here is not the relatively tame one that flows through Bandelier National Park, site of our usual kayaking trips. In places it leaps and bounds over rocks and boulders, and roars! Despite its name, the spring does not contain any traces of arsenic, but is cold, clear, and the water potable. One danger is poison ivy growing nearby. I found the steep downhill quite taxing, with lots of rocky switchbacks near the top, but nothing like the climb back up! There were many moments when it seemed that I would not be able to make it, hoping for the second wind that never came. There was of course no choice but to carry on.